Those that do not believe in global warming and hide their heads in the sand, are being given yet another group of reports on the now high risk of flooding in the world’s coastal areas. The floods that were once believed to be once in a century are predicted to be a common occurrence and approximately forty eight of the contiguous states in the United States will be affected by rising tides and storm surges. Three reports were done on the global warming effect on low lying areas of the United States due to rising water. The first was a non-profit organization called Climate Central. The other two reports were submitted and published in the Environmental Research letters. All of the studies and their results dictated that the low lying coastal areas of the United States will have a devastating effect from the rising waters due to global warming. Global warming has been caused by the greenhouse effect due to high pollution emissions into the atmosphere. The cost estimate for the damage to Florida is over thirty billion dollars. In the State of California, areas that never experienced flooding problems are expected to see major flooding situations in the next ten years. This is all due to a rise in oceanic waters due to global warming that will be around eight inches. The forecast gets worse as it is anticipated that sea levels will rise from two to seven feet within this century. Flooding is not the only problem. As the sea level rises, there is an increase in storms and storm surges. This means that major storms, such as hurricanes, will increase in both number and intensity. Two hundred and eighty five coastal cities in the United States are expected to have the highest impact. Many of these cities are built in low lying, sea level or in some cases below sea level areas of the coast. Florida is anticipated to have the most difficulty due to the geography and logistics. The state has a unique aquifer and drainage system and has been compared to land with a bit of Swiss cheese bedrock. It will be impossible to build protective barriers because water will seep up through the bedrock. Other states at risk include: Louisiana, New Jersey, North Carolina, Maryland, New York and Virginia. The major storms that were often not seen except every two or three hundred years are predicted to become more common. The problem is going to affect larger densely populated cities and is anticipated to affect ninety percent of the population currently living in the high risk zones. Situations that occurred with Hurricanes Katrina and Rita on the southern gulf coast area are also anticipated to be more common. 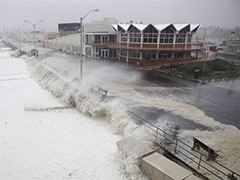 Flooding of biblical proportions, of the type seen in New Orleans, Louisiana will not only happen more often, but will repetitively occur, sometimes in the same season. If the news sounds grim, it is. The reports for the rise of water, storm surges and flooding is anticipated to affect 4.9 million people in the high risk zones. Posted on March 30th under Global Warming Issues.